FERNDALE, MI--(Marketwire - October 22, 2009) - What's on Livio's menu this fall? The NPR Radio by Livio Radio now offers quick and organized access to programming that matters to people over 50 -- programs on topics ranging from wellness to the economy and the arts -- available through AARP Radio. Livio's creators are set to show their exciting Reciva enabled radio, now featuring an AARP Radio menu, at the AARP's 2009 National Event & Expo in Las Vegas, "Vegas@50+," Oct. 22-24. "Adding AARP as an option to the Livio radio is a huge benefit for AARP members looking to rock out and catch up on programming, all away from the PC," said Greg Kim, Livio's sales and marketing manager. The addition of the AARP menu is yet another enhancement to a product that uses a wired or wireless Internet connection to provide listeners with the freedom to enjoy internet radio in the home, without using a computer. The Livio Radio also gives listeners access to thousands of other free programming options available over the Internet. "We're excited to see Livio add the AARP menu to its radio, which can only expand the ways our members can enjoy the growing list of audio content we make available live or on-demand," said Larry Gannon, vice president of AARP Radio. Founded in 1958, AARP is a nonprofit, nonpartisan membership organization that helps people 50 and over improve the quality of their lives. AARP has grown to 40 million members and has offices in all 50 states, the District of Columbia, Puerto Rico and the U.S. Virgin Islands. As the nation's largest membership organization for people 50 and over, AARP is leading a revolution in the way people view and live life after 50. AARP Radio offers more than 14 new programs each week. 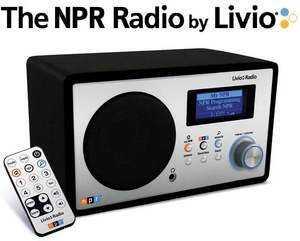 The NPR Radio by Livio sells for $199 and is currently available for preorder in the United States at www.LivioRadio.com and shop.npr.org. Founded in 2008, Livio LLC finds ways to make Internet audio streams accessible to more people, in more places. Dedicated to designing products that work fast without complicated menus, Livio developed the Livio Radio to let users listen to AARP®, NPR®, and Pandora® in the home, without a Ph.D. in consumer electronics.